Twenty-nine states and the District of Columbia permit marijuana use for medicinal purposes. 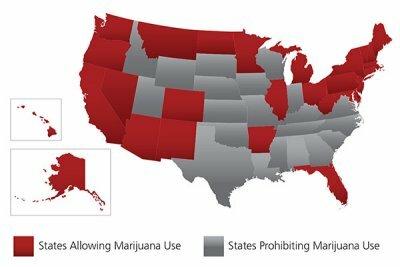 Eight of those states and the District of Columbia also permit marijuana use for recreational purposes. Despite those numbers, the banking industry has been reluctant to enter the market due to the risk of prosecution under federal drug and anti-money laundering statutes and penalties under federal banking regulations. Recent federal guidance attempted to clarify federal marijuana enforcement priorities, but did little to dispel legal and regulatory uncertainty. The fact remains that legal prohibitions and regulatory hurdles continue to create significant risks and costs for financial institutions that wish to serve the marijuana industry. Marijuana has been listed as a Schedule I controlled substance under the federal Controlled Substances Act (CSA) since 1970. The CSA criminalizes not only manufacturing, distributing, and dispensing marijuana and possession with intent to manufacture, distribute, or dispense, but also aiding and abetting in, conspiring to commit, and acting as an accessory after the fact with respect to such activities. In Gonzales v. Raich, the Supreme Court of the United States affirmed the federal government’s authority to criminalize marijuana, notwithstanding contrary state law. Thus, financial institutions that assist marijuana-related businesses operating under state law risk prosecution under the CSA. Because the provision of banking services to marijuana-related businesses is unlawful under the CSA, such action likewise constitutes a violation of federal anti-money laundering statutes. The Money Laundering Control Act prohibits certain financial transactions involving the proceeds of “specified unlawful activity,” which includes the manufacture, importation, sale, or distribution of a controlled substance as defined in the CSA. The Illegal Money Transmitters Act prohibits involvement in a business that transmits funds that are known to be derived from a criminal offense or are intended to be used to promote or support unlawful activity. Together, the Bank Secrecy Act (“BSA”) and the USA PATRIOT Act require that financial institutions undertake sufficient due diligence to verify the identity of customers and assess the risk associated with each customer. They must also file “suspicious activity reports” (SARs) with the Financial Crimes Enforcement Network (FinCEN), a bureau of the Department of Treasury, for customer transactions suspected to involve funds derived from illegal activity. By virtue of their participation in the federal banking system, financial institutions are subject to regulations that also punish relationships with marijuana-related businesses. Federal deposit insurance and membership in the Federal Reserve system both require compliance with federal banking regulations, which, in turn, require compliance with federal money laundering statutes. Both the Federal Deposit Insurance Corporation (FDIC) and the Federal Reserve monitor institutions for compliance with the BSA. Almost all state and nationally chartered institutions are legally required to purchase federal insurance and are thus subject to FDIC regulation. The Federal Reserve’s oversight extends to state-chartered member banks and all bank holding companies, which, in the United States, control some 80% of banks and approximately 99% of all insured commercial bank assets. In August 2013, the Department of Justice issued a memorandum outlining eight enforcement priorities under the CSA in light of ongoing state-level marijuana legalization, including preventing distribution of marijuana to minors, routing of revenue from marijuana sales to criminal enterprises, and diversion of marijuana from states where it is legal to states where it is illegal. In February 2014, the DOJ issued a second memo stating these priorities would apply to the prosecution of marijuana-related conduct in the context of financial crimes, particularly the federal anti-money laundering statutes. Both memos indicate that the primary inquiry in all cases is whether the conduct in question implicates one of the eight enforcement priorities. The memos also state that conduct in compliance with an effective state regulatory system is unlikely to do so. In tandem with the February 2014 DOJ memo, FinCEN issued guidance clarifying BSA compliance expectations for financial institutions providing services to marijuana-related businesses. The guidance requires institutions to review the licensing application and any information about the business available from the state licensing authority, to become familiar with the normal business practices of its marijuana-related business customers, and to monitor public sources of information about customers. Institutions also must monitor for suspicious activity, including certain red flags that indicate the activity implicates a DOJ enforcement priority. With respect to reporting requirements, the guidance confirms that institutions must file an SAR for most activity involving a marijuana-related business operating under state law. The DOJ memos and FinCEN guidance have proven ineffective in persuading financial institutions to serve the marijuana industry, evidenced by the fact that very few banks have formed relationships with marijuana-related businesses and the fact that the marijuana industry continues to report difficulty accessing banking services. In terms of criminal liability, the controlling United States Supreme Court case holds that state legalization of marijuana is not a defense to enforcement of federal criminal law. Furthermore, although the 2013 and 2014 memos imply that banks will not face criminal prosecution, the memos clearly state that the DOJ retains authority to enforce federal law and that the memos do not provide a legal defense to enforcement. Thus, federal prosecution remains a very real risk. Punishment for a conviction under the CSA or federal anti-money laundering statutes can include potentially steep civil or criminal money penalties and imprisonment. In addition, institutions risk loss of deposit monies and collateral under the asset forfeiture provisions of the CSA and anti-money laundering statutes. In terms of regulatory liability, the Federal Reserve, the FDIC, and FinCEN all have the authority to impose civil money fines for violations of the BSA. FinCEN’s fines have been known to reach into the millions. The FDIC also has the authority to revoke deposit insurance altogether, which would effectively force the closure of an institution required to carry federal insurance. In terms of regulatory cost, FinCEN’s 2014 guidance stated that it expected the new BSA compliance requirements to “enhance the availability of financial services for marijuana-related businesses.” However, the guidance contemplates a level of due diligence far exceeding that required in typical banking relationships. There is cost associated with the additional filing requirements, and there is cost associated with determining whether customer activity implicates a DOJ enforcement priority. Taken together with the potential criminal liability and risk of fines and loss of access to the federal banking system, the costs and uncertainty associated with heightened due diligence requirements will continue to be barriers for financial institutions that wish to serve the marijuana industry.